When Time's special issue on the death of Osama bin Laden hits newsstands Thursday, it will be the fourth cover in the magazine's history to feature a red 'X' scrawled across the face of an American enemy. 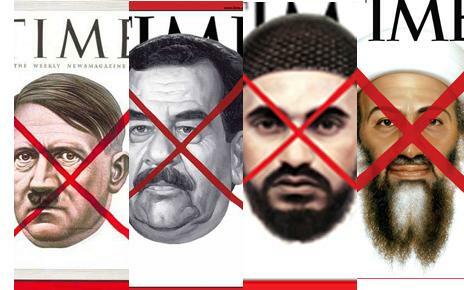 The other American enemies pictured above, and the Time Magazine publication date, are Adolf Hitler (May 7, 1945), Saddam Hussein (April 21, 2003), and Abu Musab al-Zarqawi (June 13, 2006). Interesting to note that a country was also shown in this fashion when Japan was X'ed out on the August 20, 1945 cover.